UPDATE, 6:40 PM: THE FOLLOWING WAS POSTED AND TWEETED TWO MINUTES BEFORE THE LATEST RAIN DELAY. The tarp is back on the field and it is raining. The only good news is there is no lightning in the area. 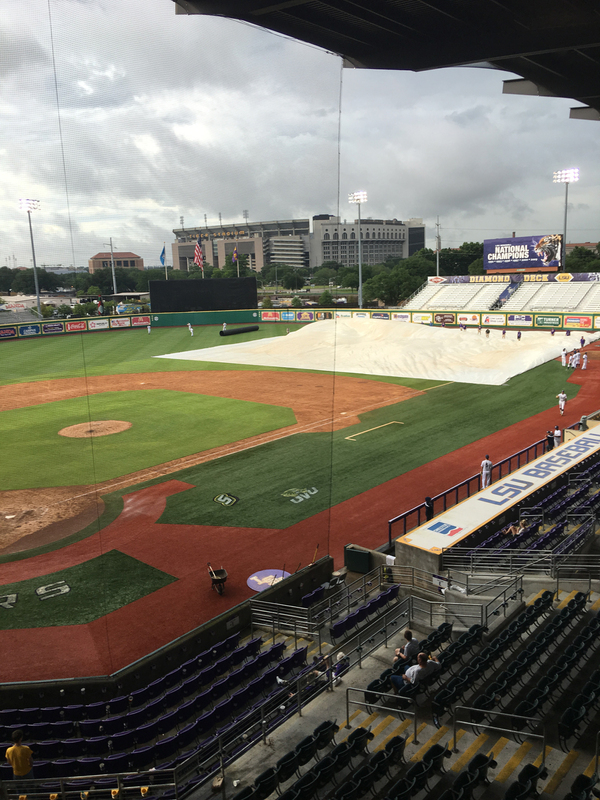 The Owls’ first game of the Baton Rouge Regional started at 9:04 a.m. but after six complete innings and a 4-1 Rice lead over Southeastern Louisiana, Mother Nature took over once again at 11:17 a.m. and put us in a delay of more than seven hours. After going back to their respective hotels at around 12:15 p.m., the Owls are now tentatively set to resume at 6:45 p.m.
NCAA officials hope (fingers crossed) that they can get this one in the books and the next game — an elimination game between Utah Valley and the loser of this one. The winners’ bracket was supposed to be played this evening at 7 but has been rescheduled with a TBD tomorrow. We’ll have game photos, post-game audio and a FINAL SCORE shortly after the game concludes (knock on wood). 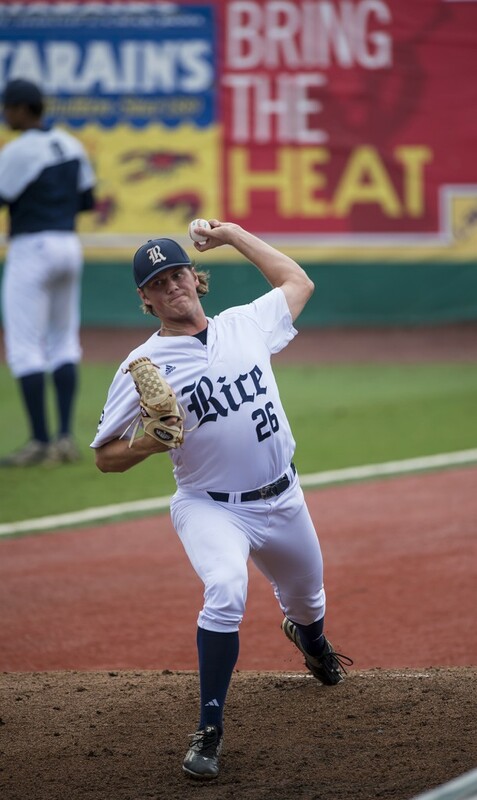 Blake Fox pitched all six innings, giving up one run on three hits, four walks and four Ks on 97 pitches. He brought the heat! Nice job by Tommy LaVergne on this shot.